The SENNEBOGEN 880 EQ deployed at the Port of Izmir by the Turkish logistics service provider, IDC Liman Isletmeleri A.S., loads cargo at approximately 600 tonnes per hour. The machine is ideal for unloading ships and for loading trucks. On a total harbour area of 191,000m2, as a service provider, IDC daily handles tonnes of bulk goods and piece goods in the harbour of the Turkish city, Izmir. Here the firm relies on the largest hydraulic material handling machine, the proven SENNEBOGEN 880 EQ. The well- designed equilibrium concept of the SENNEBOGEN 880 EQ saves approximately one third of operating costs. The balanced counterweight keeps the main boom in balance and enables fast and fuel-saving work. Since 2008, daily 14,000 tonnes of coal have been unloaded from the arriving ships, and loaded onto trucks from the intermediate storage facility. A 470kW diesel engine ensures the power reserves necessary for the demanding continuous implementation. With a range of 33m and a maximum safe working load of 30 tonnes, even the largest ships and heavy piece goods can be comfortably unloaded. Thanks to the stable crawler undercarriage, the machine can be used flexibly on the harbour site. With the operator cab placed 5m forward, the floor window, and the excellent all- round view from the 1.5m-wide harbour cab, the operator always has the work area in view. The machine has been elevated an additional 7.2m via a pipe-pylon. A total of nine headlights safely illuminates the work area at night. 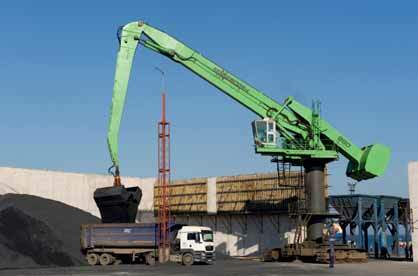 Equipped with an 8m3 double shell grab the machine loads the arriving trucks in the shortest time possible. A complete cycle takes just one minute. The logistics service provider has been handling goods of all types at Nemrut Bay since 1983. For this, the company has been relying on SENNEBOGEN material handling machines for some time. For the customer, the robust design, a simple machine concept, and the highest level of reliability are the key arguments for the green machines. Forsen handles the regular on-site service as the Turkish sales and service partner. Simple maintenance tasks can also be handled autonomously by the operator thanks to the easily accessible service space. The factory-provided special paint finish for maritime implementation protects against corrosion and preserves the components.